Armed insurrection in Syria is still alive and well, despite the world’s attention shifting to other troubles. While the issue of Syrian refugees is difficult and still unsolved, those who continue to suffer within the country’s borders also need attention. According to the United Nations almost 600,000 Syrians are considered to be “under siege,” in other words living in areas blockaded or controlled (or both) by pro-Assad forces. Another estimate puts the besieged number at “almost one million,” in 49 areas cut off from aid by government soldiers. In recent weeks the U.N. has achieved some success, but also taken significant criticism, for its efforts to deliver food, medicine, and other needed supplies to those who desperately need it. 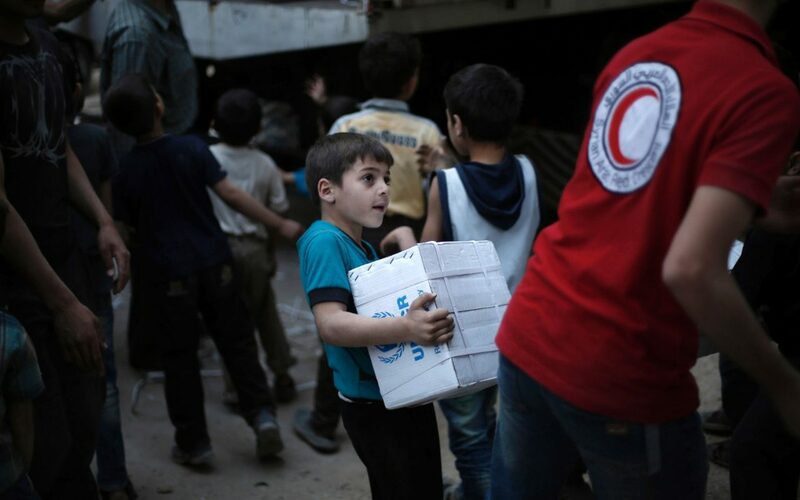 On June 9, the U.N. and Syrian Arab Red Crescent were finally able to get food to residents of Daraya, a small Damascus suburb, for the first time in almost four years. Rebels forces seized control of the town in 2011, and the Syrian government surrounded it in late 2012. Since then Daraya has seen some of the worst bombardment of the entire conflict. But after reaching an agreement with the Assad regime to gain access to besieged area, the U.N. helped orchestrate delivery of food flour, and medical supplies. Yet, the following day, new airstrikes against the town were reported and opposition activists claim that the government allowed just “minimal amounts” of food to be transported. Yet the U.N. appears to view the operation as a success. Outside of Syria, an evaluation of U.N. actions revealed troubling findings. A Lebanon-based opposition advocacy group called The Syria Campaign released a report on June 15 concluded that the U.N. has become ineffective in implementing its aid strategy. Moreover it has essentially ceded control of billions of dollars of money for aid to Assad’s regime. The report is based on interviews with current and former U.N. staff, and indicates that Assad, not the U.N., controls the disbursement of humanitarian aid money and supplies. Thus, according to The Syria Campaign, the U.N. is tacitly “enabling” the government’s use of “sieges as a weapon of war.” The Syria Campaign report found that in 2015 almost 90% of requests for aid made by the U.N. were ignored or denied by the regime. What is deeply concerning is that this is hardly the first time the U.N.’s effectiveness in Syria has been called into question. In Foreign Policy, David Kenner writes that observers have “long accused” the agency of being “hopelessly beholden to the Syrian government.” Kenner continues that the U.N. seems no closer to reaching certain government strongholds now than when the Syrian conflict was in its early stages. He also characterizes U.N. behavior toward the regime as kowtowing. It is hard to imagine that so many Syrians remain cut off from the outside even now, five-plus years after the conflict started. It’s also hard to believe they are being blockaded by their own government, and denied access to food and medical care. It should be priority #1 for the U.N. and other humanitarian agencies to do whatever takes to get the Syrian people what they need. There is no question the U.N. has to walk a fine line in its negotiations with the Assad regime. However if the claims of former U.N. officials in The Syria Campaign report are accurate, the agency needs to change its approach, find some other way of making sure aid goes not just to government strongholds, but all citizens. If what has been tried so far by the U.N. and other organizations, militaries, and governments is not reaching suffering people, they need to try something else. And try harder.